Mash mascarpone and goat's cheese together with a fork, then spread evenly onto puff pastry squares, keeping the section between the score and the edge bare. Break apart red onion slices into rings and arrange over cheese mixture. Remove from oven and let cool for 5 minutes. Cut through top layers of puff pastry along the score lines, so that the middle sinks in. 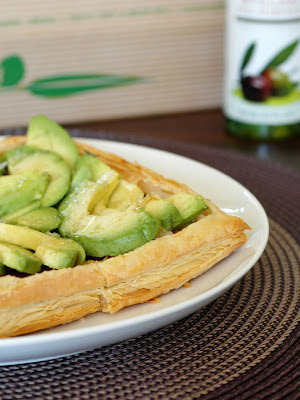 Let cool for another 5 minutes, then cover generously with slices of avocado. Drizzle olive oil over avocado, and finish with salt flakes and freshly cracked pepper.